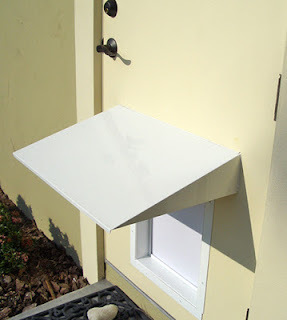 Plexidor Pet Doors: Awnings for pets? A pet door isn't much different from a regular door or window, and even the best door can let some of the outside world come in as a pet enters or leaves the house. The PlexiDor Awning is a stylish way to prevent rain, sun, snow, and wind from entering through a pet door. As a bonus, it also provides some shade. The awning is made from aluminum with a baked-on finish in white or bronze. It's a one size fits all design, 23 1/4" wide by 16 5/8" deep. Thanks for sharing! This is the cutest thing I have even seen, I only wish I saw it sooner. I just purchased an awning for my home from awnings Boston MA. Now I may have to give you a call because I want one for my pup! This is such a great invention.